my cousin made this meal. my cousin who “can’t cook”. he got high cholesterol results back from an annual physical a few months ago, and immediately changed his diet. he went from eating mostly red meat and heavily processed and packaged foods, to eating no red meat, and almost nothing that could be considered “junk food”. his cholesterol’s in check–no medication! oh, and in the process he’s already lost, oh i’d say 15 pounds by looking at him. his skin is now way, way better than mine. (i’m happy for him but also slightly annoyed by that…) seeing how seriously he took this attempt to be more healthy, i happily volunteered to help him start cooking for himself so that he could have even more options and control over his meals. i was so impressed by his amazing meal, which he made with my guidance and organization, but with very little assistance from me, and more importantly by his eagerness to learn how to cook, that i thought i’d share it with you. these were the goals that i identified for my cousin, for tasty, easy weeknight cooking. eat non-boring salads. salads can be really dynamic and nutritious, or not. 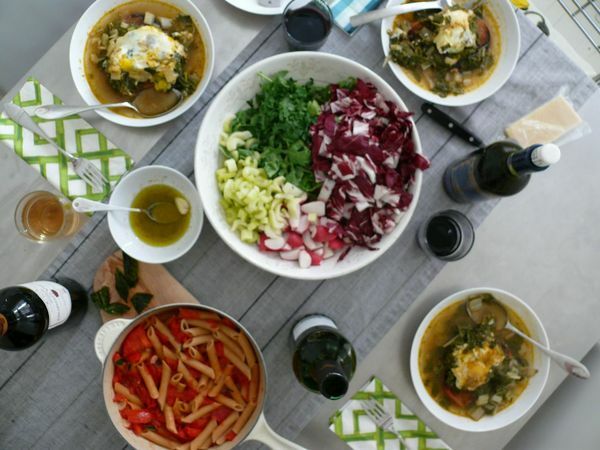 learn to make soups from scratch, and build them into awesome meals. make amazing sauce that could be tweaked a hundred ways. and most importantly: learn how to identify and buy quality, fresh produce. because my cousin has no experience cooking, and he wants to be able to cook on his own, we felt using recipes were the way to start. i picked 3 uncomplicated recipes that were good foundations for learning some basics, so that they would hopefully be a launching pad for him to make his own variations soon. two recipes were mine, one was from a cookbook, and the first step was to read the recipes fully! he quickly saw that one soup needed to simmer for 40 minutes, but that nothing needed to be soaked overnight–a surprise you never want to come across when you’re hungry and just home from work in the evenings. next, my cousin made the grocery list. instead of being intimidated by ingredients he couldn’t pronounce, he asked me about them and i equated them to an herb he was really familiar with, for instance. i know what it’s like to skip over a recipe for cardoons because i’ve never cooked them, and how amazing it is to have a little world open up for me when i finally do, because i’m willing to learn about buying and preparing them and how easy it is too cook them. hopefully the next time he’s unfamiliar with an ingredient, he’ll look it up and explore it instead of passing on it. next, we went shopping. we looked over fresh mushrooms, eggs and other everyday ingredients, smelled to learn the difference between flat-leaf parsley and the similar looking but super-fragrant cilantro, squeezed celery for clues and in the end, he pointed out a terribly disgusting rotting bunch of radishes that had no business being on the shelf to the produce manager. i think he left fairy comfortable with checking out that section of the grocery store, even though there is still a lot there that’s new to him. i think he gets that the only trick to buying good food is to use all of your senses. back in the kitchen, having read the recipes in advance helped my cousin to feel confident about the process. he timed things really well, making sure that soup started early and working on the salad while it simmered. he poached the eggs last, after we talked about how little heat it took to keep eggs cooking once they started (some things you learn from experience! ), and we sat down to a 3-course meal that was absolutely delicious. but in the end, eating fabulously well is about eating what you’re craving. i started to cook because i wanted to eat what i wanted to eat when i wanted to eat it. if you can reward yourself that way, cooking is less about work, and more about pleasure. so back to how to eat fabulously well… if you’re anything like me, it’s to follow the goals outlined above. yes, the same ones! last week, my friend put cucumber on a pizza we were making. it made me uneasy. it turned out delicious. think of foods you like, put them in your salad. when it’s cold and you don’t feel like eating salad, think of a vegetable you like or that looks stunning in the store, say deep red beets, and positively celebrate them for dinner that night. be non-boring about it. always steam them? treat them to some good olive oil, herbs and…mustard? why not? cut them beautifully, toss them in your dressing, roast them, serve them in a great plate, eat them with polenta you just stirred some cheese into and that could be dinner. total hands on-time, 15 minutes? but you were drinking wine while you stirred the polenta, right? so even that wasn’t that much work. remember that basic soup you made? the one where you just cut up vegetable and put them in the water to stew away while you (insert your favourite after-work activity here)? this time add some dried porcini mushrooms, blend it when it’s all ready, then add drained navy beans and let it go for longer. serve with a drizzle of your best olive oil which will just float on top of your thick, hearty meal, dust it with grated cheese or fresh parsley, admire it while you sip more wine. i bet your favourite sauce would taste great curried. like if you toasted some curry powder in the same oil that the garlic was frying in before you went ahead with your specialty. you could go ahead and boil pasta now as usual, or you could add vegetables to it instead and serve it with basmati rice and raita. nothing has to take a lot of time to become special, and i am of the mind religion that every meal you eat should be special. i’m also of the mind that making complicated or unfamiliar recipes when you don’t have time or energy to spend in the kitchen is useless. so just elevate your meal in anyway you can, and enjoy yourself. but do cook. unless you have a personal chef, it’s the only way to make sure you’re eating fabulously well every night. a “pickled” tomato sauce–only a few more weeks of fresh tomatoes at the market! pasta with fried almonds, olives and herbs. quiche! and here, i’ll mention that adding a poached or fried egg to dinner makes it better. almost always. an oldie but still one of my favourite tofu recipes. and paprika oil makes everything special. enjoy! Must’ve been nice to teach your cousin cooking from beginning to end though! I always try to relate these principles to non-cookers but I never seem to get the chronology right for people. I guess it helps when the other has a willingness to learn as well! i think thats it exactly, he was really willing to learn. ive heard hes cooking more at home since then–that makes me so happy for him!